The most controversial Governor in Nigeria, Ekiti State’s Ayo Fayose slammed President Muhammadu Buhari in Lokoja yesterday while campaigning for PDP Governorship candidate Idris Wada. 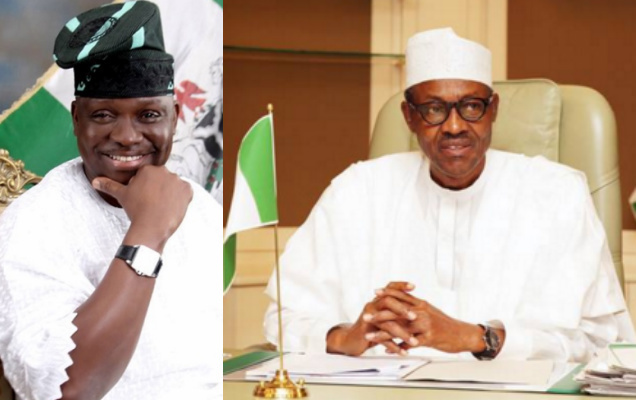 Fayose said Buhari’s administration is similar to that of Obasanjo who ruled between 99 to 07. He said the two retired military men have no respect for the law. Buhari’s anti corruption campaign go soon reach Ekiti… get ready GEJ pikin. I like this man……the truth must b told. Fayose is my man i love him, buhari is a dictator, who is afraid of him ? His anti corruption war is selective, infact his party are stupid for making all the sugar coated promises without fulfilment, ****. The time is nearly, I strongly believed that the Lord Jesus Christ will change this country Nigeria for good and for the Ekiti State governor, his reward of attitude is at his back of him. Oh Lord, I pray for all the good Leaders of this country Nigeria, Daddy, give them power and wisdom to lead this country to the promise land in Jesus name(AMEN). I always like this man,fayose. He’s the only outspoken pdp governor… Can I say he’s FELA the 2nd? please we are tired of this politicians, the are only after their own pockets. poor masses are suffering. very soon the youths will rise up and evolution will be the order of the say. mark my word. Im a kind of lk dis guy sha. He is out-spoken & fearless in oposition. Na dia buhari go fia nah. Governor Fayose is a thug and a vagabond who rigged his way to power with the help of corrupt Jonathan administration. This crook has been governor of my state for over four years with nothing reasonable and tangible to show as his achievement. It laughable to hear this hypocrite critic of PMB as a dictator while his records as Ekiti state governor as been nothing short of humiliation of the opposition, harassment of opposition with area boys and faluire to pay salary of any group or person who dear challenge his dictorship authority. I guess in Fayose’s small mind,that is called democracy but not dictatorship? What a shameless thug! What Gov. Fayose is doing is what I called “Reverse Psychology ” He thinks picking a fight with PMB on the media will shield him from been probe by CCT and EFCC for his election fraud, mismanagement, misappropriation and for embezzlement of the state allocation. Fayose is a total disgrace and a political nuisance that many great people of my state dislike. Governor Fayose days as governor of my state are numbered. He is doing this to draw unnecessary attention to himself instead of minding the business, affairs and growth of Ekiti state. It is still a misery how this thug endup becoming the governor of millions of highly educated people of Ekiti state. This crazy guy lack common sense and wisdom to govern over millions of great people of my state. This boy has no manners. It is disrespect for elders that shortens the life of a youth. If the younger generation do the right thing, why do elder statesmen who have paid their dues have to come back to fix their mess? Besides, the two elder statesmen are retired army personnel, so, their styles have to be similar. Fayose opens his mouth and speaks recklessly, that is not being outspoken. Let Fayose shut his damn mouth. If he has nothing to say he may as well remain silent. People like Fayose run their mouth in a Country like Nigeria. What I observed in our democracy system is that we need a little bit of martial law to checkmate our law breakers because most Nigerians are hard-hearted, they find it hard to obey simple rule. Fayose prefers someone like GEJ so that he can misbehave anyhow and do whatever he likes but Buhari is not ready to play that. Look here oh boy! Buhari is coming after you, by the time he’s through with you, nobody will be able to rescue you from his jaw. Just wait and see.